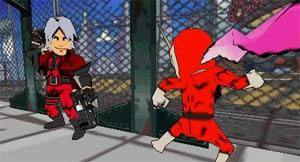 The Joe series has been well received by the gaming community since the launch of the first game on the PS2. The side scrolling action on the game is a nice change to a lot of other games and a bit of a retro touch as well. This game is basically a port on the PS2 game and there are not a lot of enhancements made to the smaller format. In some respects this is a reassurance for those who do not own more than one format, on the other hand for fanatics of the series, it’s nice to see little extras added to “your” format. 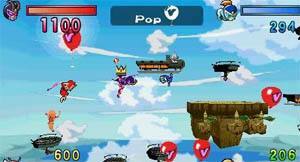 The game is not dissimilar to Super Smash Brothers in the way that it presents itself with multi platforms and all sorts of levels and other bits and pieces. The game environments are on land and sea and the amount of crazy characters certainly makes you think of that other fighter. The pace of this game is frantic and scattered through the gameworld are a series of powerups and other items that are going to make it all the more hectic. The graphics whilst nice do get crowded on the screen at times, despite the clarity and lush colours of the screen of the PSP. The control system is pretty intuitive and most players will find that they are able to pick the game up and play it. Using the network ability on the PSP allows you to have up to four players duking it out for some fun action as you lay the smack down with your mates. Combinations are easy to carry out and certainly do the desired amount of damage, along with the effects and sounds that let you know that you did something right. Fighting can take place left and right, up and down the screen with fighters dropping from level to level to lay the smack down. It’s a lot of fun and makes for some good expenditure of your time that you are sure to enjoy. I think that your casual gamer might be so so about this title on occasion. The actual meat behind the game is pretty shallow, however the speed of the action will make most people overlook that. The only problem is that other than for the already existing fan base, a lot of players may not see this title as being more than a passing distraction regardless of how good it is.